I’m behind the bar, it’s Wednesday night, 9ish, pretty slow, ten people at the bar, a handful out at the tables. I make a martini, serve it up, finish the transaction, then, check my phone. For no reason in particular. I took off the Facebook app off my phone. You can guess why. I AM SO SICK AND TIRED OF UPDATING MY APPS!!!! Every day, there’s four more apps to update. I swear to God, I update the same apps twice, three times a week. BUG FIXES!!! I get so sick of updating apps, I start deleting them. Ohhh…Linkedin app? You want me to update? I DONT EVEN GO ON LINKEDIN UNLESS IM ABSOLUTELY BRAIN DEAD. 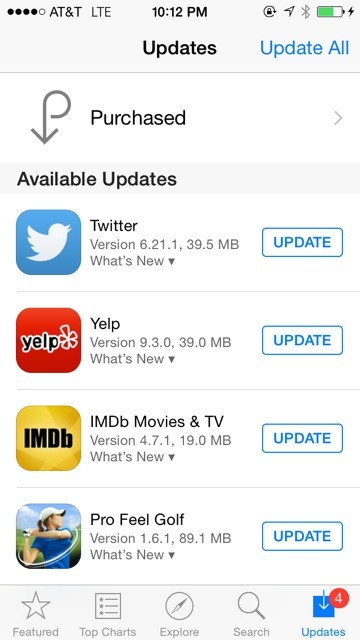 Oh look at that…Yelp wants me to update their app. You know what Yelp? Here’s my review of you. YOU SUUUUUCK!!! Guy at the bar says, dryly, is that your Jerry Seinfeld impression? YEAH, I say. IT IS. This entry was posted in Bar Story on February 19, 2015 by Clint Curtis.